A clean room is one of the most important rooms in a hospital and laboratory. These rooms are kept perfectly sterile and are used to perform surgeries, house infectious patients, and store potentially dangerous samples in Manchester. Microbes can’t get into or out of a clean room. As you can expect, it’s certainly not easy to create one of these rooms. Manchester clean rooms need to have specially designed suspended ceilings to prevent dirt from entering the room. A standard hard ceiling isn’t enough for this kind of thing. The ceiling is also typically where the electricity and ventilation of a clean room are managed. 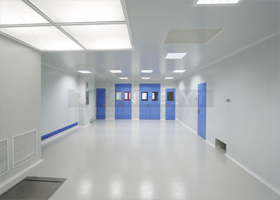 KP Ceilings LTD understand the challenges of creating the right clean room suspended ceiling. That’s why you can count on our plain unperforated clip-in tiles to create a clean but functional ceiling. Creating a truly air-and-dust-tight ceiling is done by connected bevel edged tiles together using silicone sealant. Silicone can also be used to completely seal the perimeter tiles and trim by connecting the rear face of the perimeter trim to the tiles. This ensures that absolutely nothing gets in or out of the ceiling. At least, nothing that is not needed. Should you need to have access to the ceiling for whatever reason, then it is possible to break the silicone seal by running a sharp knife across the joints of the tile. You can then remove the tile using a blade extractor or a vacuum lifter. The tile can then be reapplied using silicone seal when the work in the ceiling is finished. We use only the latest systems to create the ideal temperature and humidity-controlled environments to conform to the standards set by the government and the industry. You can be sure your Manchester clean room suspended ceiling keeps out all dust, moisture, and microbes. We fit the ceiling, attach light fixtures and filters, and then create an airtight barrier. It’s not easy at all to create a clean room, but we know how to get it done. Our team of professionals will assess what needs to be done in the room and provide you with a quote. We ensure our quotes are as accurate as possible to prevent unexpected or hidden costs. The price we quote you is as close to the price you will actually pay as possible. Contact KP Ceilings LTD to have your Manchester clean room suspended ceiling constructed today!